Robotic-surgery expert Intuitive Surgical (NAS: ISRG) has a habit of absolutely crushing analyst estimates. Three months ago, the maker of da Vinci surgical systems blindsided Wall Street once again, stretching its streak of consecutive earnings beats to 11 quarters. Will the company score surprise No. 12 (no to be confused with Mambo No. 5) on Tuesday night? For the first quarter, your average analyst expects to see earnings of $3.14 per share on $465 million in sales. 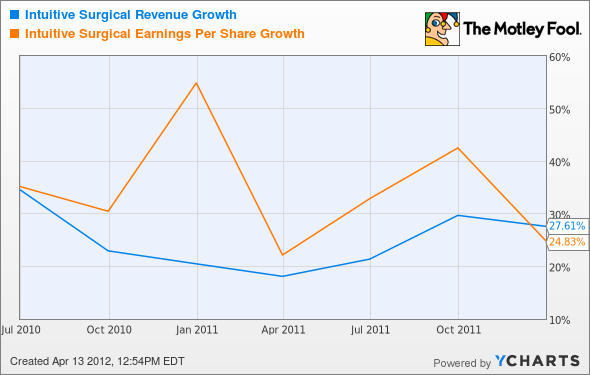 That would amount to 21% year-over-year earnings growth on 20% stronger revenue. To be fair to the startled analysts, Intuitive's management likes to set expectations pretty low. The long-term target for revenue growth is a modest 17% to 19% a year. That's a pretty modest goal given the enormous growth potential that's still ahead of this innovator. For example, Intuitive is growing like gangbusters overseas. As Fellow Fool Eric Bleeker shows, sector rivals such as Boston Scientific (NYS: BSX) have proved that medical innovations form America can become big business abroad by collecting nearly half of their sales outside U.S. borders. Intuitive currently collects just 22% of revenues from other markets. Keep an eye on international sales in this report. Intuitive Surgical's business moat is safe as houses filled with razor wire and starving zombies swimming in superheated aqua regia -- not to mention patents and FDA approvals. The company has no serious head-to-head rivals, though sector neighbors MAKO Surgical (NAS: MAKO) and Hansen Medical (NAS: HNSN) are carving out their own niches in specialized types of robotic surgery. That's why Intuitive is not only my largest personal holding but also by far the most successful stock in my CAPS portfolio. That CAPScall stays firmly in place because I'm certain that the company still has its best days ahead of it. The Fool's expert on all things medical, Brian Orelli, says that Intuitive Surgical is the best stock for your IRA portfolio, and this Motley Fool special free report discusses how robotic surgery is the wave of the future. I expect Intuitive to keep beating analysts about the head and neck with its massive growth. At the time this article was published Fool contributorAnders Bylundowns shares in Intuitive Surgical but holds no other position in any of the companies mentioned. Check outAnders' holdings and bio, or follow him onTwitterandGoogle+. The Motley Fool owns shares of MAKO Surgical.Motley Fool newsletter serviceshave recommended buying shares of Intuitive Surgical and MAKO Surgical. The Motley Fool has adisclosure policy. We Fools don't all hold the same opinion, but we all believe that considering a diverse range of insights makes us better investors. Try any of our Foolish newsletter servicesfree for 30 days.